It’s been absolutely ages since I last had fish and chips. Usually I operate on a strictly by the sea policy. I like to be able to smell the salty air mixing with the vinegar-soaked chips and have the wind blowing my hair across my face and into my ketchup. It’s messy and annoying but the nostalgia and British romance makes up for it. I also like to be able to finish my fish, something that I find totally impossible when I’m not trudging along the beach concentrating more on maintaining an upright position along the cobbles than on what I’m eating. And another thing. I get cross when I’m refused a childs portion. Anybody who has stood next to me would understand how utterly ridiculous such a refusal is. In what universe could a girl hovering just over the 5ft mark (yes, I made it), polish off a box of chips the size of her face and a fish double those proportions. That’s right, no universe! With all that out of my system, now we can get back to business. 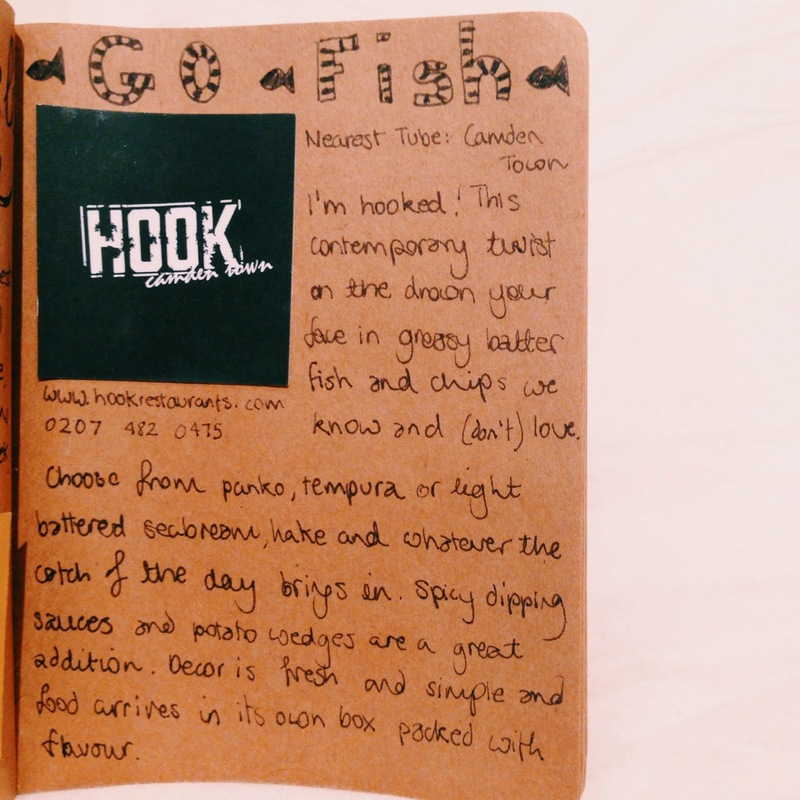 Hook in Camden has finally inspired me to lift my ban on city fish and chipping and it's actually got me rather excited. Minus Camden being all Camdeny outside, we might as well have been at the seaside. With the maritime decor, blue and white walls and simple bright furnishings, all Hook is missing is an atmospheric waves lapping against the beach soundscape. The menu is awash with exciting flavours and contemporary twists. None of this cardiac arrest inducing grease soaked batter and there’s not a soggy, flaccid chip in sight. Instead you’ll find a shoal of different fish, from Thai green tempura Sea Bream to Jamaican Jerk Haddock with Japanese Panko breadcrumbs all served with seaweed salted chips and one of the 6 different varieties of sauce. We were given a taster box of each of the sauces and while I was totally sold by the garlic truffle and Thai green, my companions each had different favourites. The chips were less chippy more potato wedgy and were nestled underneath the fish which arrived to the table in its very own wooden branded box. None of us even came close to finishing the chips and I’m sure they wouldn’t have minded boxing the remains up for us to nibble on our way home were we not hopping over to Knowhere Special immediately after dinner (more on this soon). As usual I can’t go anywhere without commenting on the lighting and this time was no different. Claw – like fixtures hung from the ceiling over equally claw like chairs in keeping with the seaside feel. From our table we could see a snapshot of the kitchen, well, a chest and a bowl for the main part which I believe belonged to Simon, half of the Hook pair. Childish brain engaged, I was thinking of various props I could bring with to create a live version of heads, bodies and tails .. but I digress. Originally starting up in Dublin on a market stall with a ton of enthusiasm and some great quality local fish, business partners Barry and Simon have gone from strength to strength. Their first restaurant in Brussels was a huge success and now boasts over 50 different styles of Fish & Chips with 30 different homemade sauces. With this in mind, the pair have now sailed to London, bringing with them their seaside taste twist to give us city dwellers some much needed Omega 3. Hook is a great spot for a casual evening catch up or a weekend fish and chip feast with your band of brothers, there’s talk of daytime DJ’s and brunch parties but I’ll keep you updated on that. They also do takeaway if it’s one of those days where the idea of straying any distance from your sofa fills you with dread. Either way, I'm hooked!